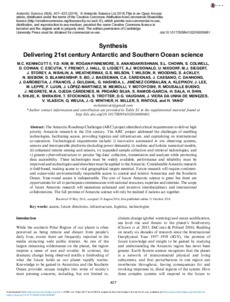 The Antarctic Roadmap Challenges (ARC) project identified critical requirements to deliver high priority Antarctic research in the 21st century. The ARC project addressed the challenges of enabling technologies, facilitating access, providing logistics and infrastructure, and capitalizing on international co-operation. Technological requirements include: i) innovative automated in situ observing systems, sensors and interoperable platforms (including power demands), ii) realistic and holistic numerical models, iii) enhanced remote sensing and sensors, iv) expanded sample collection and retrieval technologies, and v) greater cyber-infrastructure to process 'big data' collection, transmission and analyses while promoting data accessibility. These technologies must be widely available, performance and reliability must be improved and technologies used elsewhere must be applied to the Antarctic. Considerable Antarctic research is field-based, making access to vital geographical targets essential. Future research will require continent- and ocean-wide environmentally responsible access to coastal and interior Antarctica and the Southern Ocean. Year-round access is indispensable. The cost of future Antarctic science is great but there are opportunities for all to participate commensurate with national resources, expertise and interests. The scope of future Antarctic research will necessitate enhanced and inventive interdisciplinary and international collaborations. The full promise of Antarctic science will only be realized if nations act together.